A world which is good for wildlife is good for people - Annual Parish Meeting May 7th, 2019 at Minting Village Hall 7p.m. 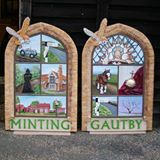 Mintingandgautby.co.uk was established in 2010 . Our mission has been to provide a focal point for anyone with an interest in our area. If you’re living in Minting, Gautby, Waddingworth or Wispington or visiting the area this website is for you! We provide information on what’s on locally, links to relevant sites, clubs, businesses and charities.